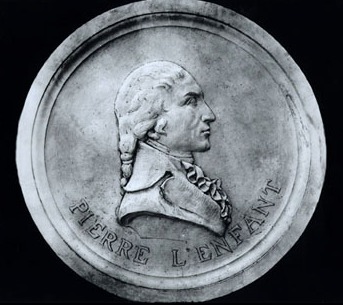 Pierre Charles L'Enfant, “Pierre Charles L'Enfant,” Histories of the National Mall, accessed April 22, 2019, http://mallhistory.org/items/show/82. L'Enfant was an architect and civil engineer chosen by President George Washington in 1791 to survey and design the new federal city of Washington. L'Enfant designed streets in a grid pattern, and he placed major government buildings and parks in the plan. He also designed a "grand avenue" stretching west from the Capitol to the Potomac River, which we now call the National Mall. Disagreements with the city's commissioners led to L'Enfant's dismissal in February 1792. Never fully implemented, his vision for the city continues to influence planners and designers today. Pierre Charles L'Enfant was born in Paris, France and studied at the French Royal Academy of Painting and Sculpture. He arrived in America in April 1777 as part of a unit of French engineers who came to aid the Continental forces during the American Revolution. After recovering from wounds received at the Siege of Savannah in 1779, he joined General George Washington's staff as a captain. He was with Washington during the winter at Valley Forge. His architectural career included both temporary and permanent buildings, but not all of his designs were executed. He redesigned New York's City Hall as the location for the US Congress, and George Washington took the presidential oath in that building in April 1789. Plans he created in 1794 to rebuild Fort Mifflin on the Delaware River were too complex and the job was given to another French engineer, Stephen Rochfontaine. L'Enfant died in poverty in Prince George's County, Maryland in 1825. In recognition of his service to the nation, he was reburied in Arlington National Cemetery in 1909.